A UC Santa Cruz special report: Why don't we say what we mean? How do you say what you mean—without saying what you mean? That question is more crucial to technological communication these days than you might imagine—particularly in a world where talking with your smartphone, your television, your car, and your house becomes a more commonplace experience every day. This problem is one that appeals to a researcher like McCloskey, who has dedicated his work to understanding language, and now Silicon Valley tech companies that are seeking to make mobile devices—phones, tablets, and more—that can understand and decode the subtleties of human language. And in the search for solutions, UC Santa Cruz students helping with this research have found they are able to apply their knowledge and research skills after graduating as analytical linguists for tech companies big and small. Asking your phone questions and receiving the correct information can seem astonishing—until the virtual assistant stumbles and doesn’t appear to understand a slightly more complex request. 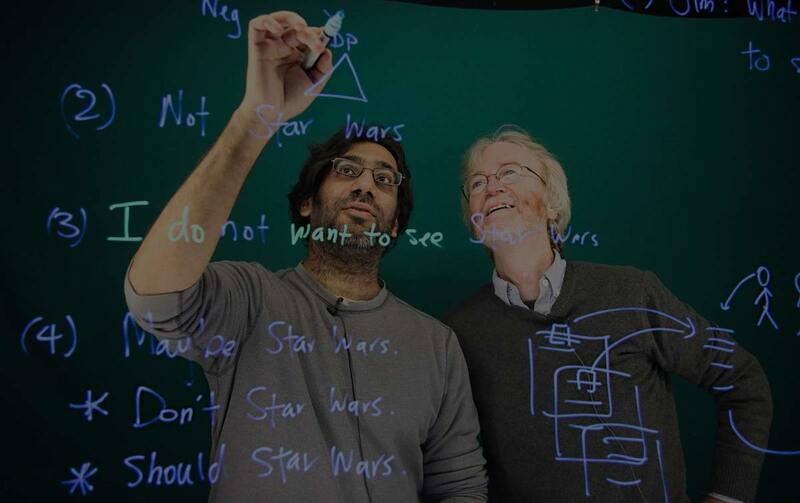 Jim McCloskey and Pranav Anand, both professors of linguistics at UC Santa Cruz, discuss the engineering problems presented by linguistic theory. McCloskey notes that speakers and writers often leave out informationally redundant grammatical material—such as when the verb “call” is omitted in “Jay Z called, but Beyoncé didn’t.” This process, known as ellipsis, is widespread across the languages of the world, and is particularly common in informal language and dialogue. Ellipsis creates challenging scientific and engineering problems. Although research over the past 50 years has shown that the principles permitting ellipsis involve many different types of information (grammatical structure, context, real-world knowledge), the precise mix of these principles and their interaction is still an open question. Progress to date has been delayed by the lack of one crucial resource: databases that are large enough to validate theories and rich enough to form the basis for machine learning. "We're very hands-on and workshop-oriented. We don't use textbooks; instead we say, 'here's a problem, let's collaborate." At UC Santa Cruz, McCloskey is collaborating with faculty and students in the language sciences to develop that resource—a richly annotated database of naturally occurring ellipsis, which will be freely available to researchers around the globe who are trying to understand what their implications might be for our understanding of the nature of human language. The project, which began with backing from UC Santa Cruz’s Institute for Humanities Research in 2013, is now funded by a three-year grant from the National Science Foundation running through the end of 2018. UC Santa Cruz linguistics professor Pranav Anand, principal investigator on the grant, noted that the reputation of the campus’s undergraduate program in linguistics was a primary reason they received the NSF grant. Although the UC Santa Cruz program is focused on theoretical linguistics, Anand said it is also driven by the needs and curiosities of the undergraduate students, who are learning new relevant skills working on this project. But Anand noted that the UC Santa Cruz Linguistics Department is still theoretically based. The pipeline to Silicon Valley is a fortuitous by-product of shared interests.